You're the Best is a thank-you note to female friends, the women we call when the best things in our lives happen—or the worst. 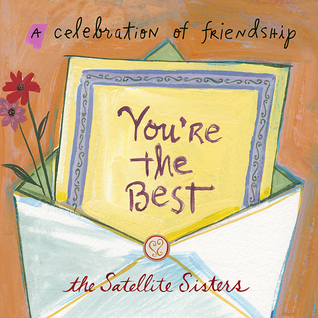 Written by two generations of Satellite Sisters, this beautifully packaged hardcover book explores how we rely on our friends to get us up, get us going, get us through, and, most importantly, get us laughing. It makes a superb gift for friends, sisters, mothers, daughters, and granddaughters. I owe you for that night at that dive bar on our road trip. I should not line dance under the influence, and I think we both know that now. I owe you for letting me borrow that really expensive evening clutch with the feathers. I had no idea puppies liked feathers. I owe you for that really poor financial advice I gave to you. It was loud on the subway, but I thought I heard that guy in the suit say, "Buy Enron." I owe you for Brad. Let's not talk about him ever again. You're smart. You're funny. You text just the right amount. You're the one person who tells my about the thing in my teeth without sounding just a little bit superior. You're The Best was an enjoyable light read that was inspiring and comforting all at once. I think that we can all use more inspiration and positivity in this world which this book provided in spades. Divided into sections and alternating from one author (sisters) to another, it was nice to have different experiences and perspectives voiced about topics we all deal with on a daily basis. Spanning many years and different lifestyles, each author had their own unique views on things which was nice to hear. I enjoyed the book quite a bit but some of the references from their radio show meant nothing to me as I was unfamiliar with it so I feel like it could appeal to a broader audience if these were left out or changed somewhat. Still a wonderful read that did not take me very long to get through and also one I am looking forward to passing on to the next person! Thank you to Prospect Park Books for our review copy. All opinions are our own.